This little bird can make a big statement at dinner parties. Cornish hens are becoming popular again, and especially for dinner parties. Originally developed in the 1950s, the Cornish or Indian Game is a breed of chicken from the Cornwall county in England. The Cornish game hen is not a game bird, but rather a diminutive broiler weighing less than two pounds. These types of hens are the most used breed in the chicken meat industry and often taste like tender normal chicken when cooked. The tiny birds make a stunning presentation at the table, and everyone gets their own. Plus, the hens are high in protein and various nutrients. 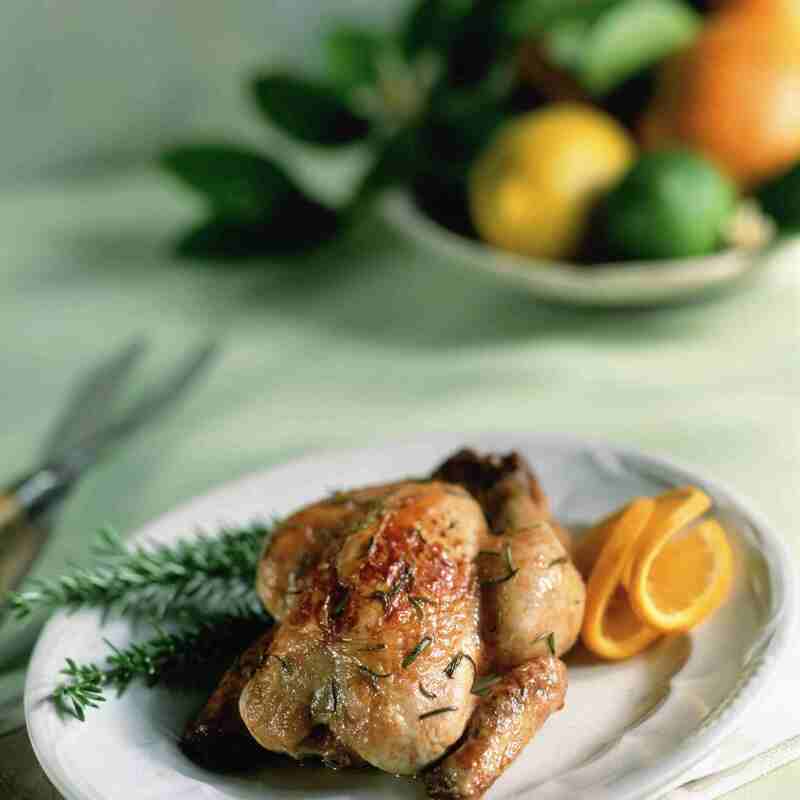 If you are serving a full-blown dinner with an appetizer or salad, two side dishes, bread, and dessert, you can use half of a Cornish hen as an entree serving. They can be prepared any way you'd use a whole chicken. For example, they can be fried, boiled, and grilled. However, roasting is the best way to prepare for Cornish hens. Stuffing proportions should be about one cup per each game hen, and they shouldn't be stuffed until right before being put in the oven due to food poisoning risks. The following recipes may be modified for use with whole chickens, adjusting the cooking time. With this recipe, you get a licorice tones from the fennel, and a touch of heat from the paprika, black pepper and pepper flakes. It's a great combination that is hard to beat. If your tastes tend to go toward fiery foods, feel free to adjust the spice amounts upward. It takes about around 75 minutes to bake the hen, but you can prep this relatively simple dish in only 10 minutes. A thermometer is also helpful in order to gauge the temperature. This may well be the easiest Cornish hen recipe yet. A simple mixture of orange marmalade, butter, and Worcestershire sauce makes a fast and easy glaze. It's great on baked chicken as well. With this recipe, you can use your favorite stuffing or skip it altogether. Try experimenting with other fruit preserves to vary the flavor. Sugar and spice make all hens nice. This recipe for Cornish hens contrasts the torrid flavor of harissa paste, pepper and ginger with the sugary succulence of honey, raisins, cinnamon, apricots and dates. Avoid being timid with this dish. The combination of the sweetness and the heat is a vital component, so don't cut back too much on the heat.